In an open letter to US lawmakers, the author explains why a Christian NGO in India was forced to shut down. Recently, 107 of you (members of the US Congress, both Republicans and Democrats) wrote to the Indian Home Minister, Rajnath Singh to allow the American charity, Compassion International (CI) to continue it's work in India. Your missive opens on a warm note: ''As the largest and oldest democracies in the world, India and the US share bonds rooted in political pluralism and respect for the rule of law." The subsequent sentences, reveal your real intent. "It is with this in mind that we write to express our deep concern over the lack of transparency and consistency in your government's enforcement of the Foreign Contribution (regulations) Act." 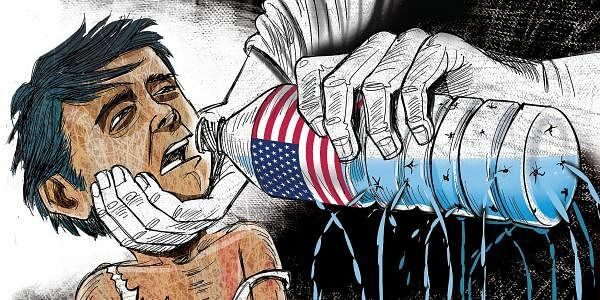 "The ongoing case of US-based Compassion International, which will have harmful consequences for many Indian children, has caused serious concern within the US Congress." Dear US lawmakers, on the face, your letter is touching, full of concern for the unfortunate destitute children of a faraway developing country. But are you sure that CI's activities are motivated purely by compassion for the underprivileged children of India? Is there no hidden agenda? What has been the record of CI since it started its operations in India in 1968? Honourable US lawmakers, you will agree that a secure home and strong family help a child cope up with poverty better. In your country, a large number of children suffer double disadvantage. They need enormous emotional support from the society to make up for broken homes, apart from monetary assistance. But CI's heart does not bleed for these hapless American children. It spends around $50 million annually in India as "humanitarian aid". Why? Because, CI has souls to save for the Christ in India and the US does not offer any such opportunity, since the destitute there are already Christians. Dear US lawmakers, CI has been duly investigated by Indian officials, within the framework of our legal system, accountable to our Parliament and Judiciary. Is it fair on your part to interfere in our affairs? CI operated through Caruna Bal Vikas Trust in India. Its child "welfare" activities included holding Christian prayers on a daily basis, celebrating only Christian festivals, offering prizes for recitation of Bible verses and holding "Compassion Young Adult Meet", where a person gives Christian inputs. Are the CI's objectives not clear? We have had enough of such "service" after the Portuguese landed in Goa in the 15th century and also when the Church secured the inclusion of a clause in the East India Company's charter Act of 1813 that opened the doors of our country to British missionaries. In the name of "service", missionaries broke families, divided communities and alienated converted individuals from the land of their birth. In the 1857 war of independence, the community of Indian Christian converts was the only one to remain loyal to the British in the areas that revolted. Are you caught in a time warp? We are in the 21st Century, but a part of you lives in 18th, wherein western Christian missionaries and organisations took upon themselves the "noble" task of shouldering the "white man's burden" of saving the souls of heathens and civilising them. Christopher Columbus "discovered" Americas for the Christian world in 1492. The long sea voyage had worn him out. The locals, later called "Red Indians" welcomed him. We all know how Columbus, his colleagues and successors returned their hospitality. Red Indians and their culture are now museum pieces in their own land. US lawmakers, you can dismiss my views as that of a Hindu zealot. But remember, even Mahatma Gandhi was so scandalised by the unethical activities of Christian missionaries that in 1935, he said, "If I had power and could legislate, the first thing I would ban is conversions." Because most conversions are through fraudulent means or inducement. You, the distinguished leaders of the US democracy, please do not become a part of the racket to purchase souls in exchange for a loaf of bread. I am sure the Christ will never forgive this. Together, we can work for a better world where everybody's faith is sacred, respected and there is no place for conversion through fraud or force. For God, irrespective of the name we give, and the path we take to reach Him, is One.